Czech composer, Petr Eben, has written a prolific body of works for choir and organ and has sought to reclaim the importance of sacred music within the context of contemporary expression. Eben's focus is political, social, and personal and reflects the perspective of a generation of artists working both before and after the collapse of the Soviet Union. His composition Windows for trumpet and organ is based on Marc Chagall's stained glass windows in the chapel at Hadassah Medical Center in Jerusalem. The four-movement work incorporates tonal, atonal, and aleatoric elements along with the most notable quotation of the Russian Hymn (also used in Tchaikovsky's Festival Overture of 1812). Dr. Bowers will present an analysis of the work drawing connections between the visual and theological subject matter that inspired its creation. Excerpts of the piece will be played with projected slides of Chagall's windows, including various preliminary sketches. A live performance of the stunning fourth movement will conclude the presentation. Greg Bowers is a composer, organist and educator. He holds degrees in music from Yale, University of Washington, SUNY at Stony Brook and Lewis and dark College. Currently he is Assistant Visiting Professor of Music at Williams College. The First Congregational Church is located at 906 Main Street (Rt. 2) in Williamstown, MA. The church is fully handicap accessible. Parking is available in the lot immediately behind the church, off of Chapin Hall Drive. WILLIAMSTOWN, Mass. 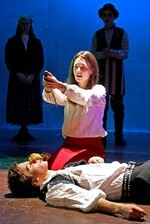 -- High-school students throughout Berkshire County are readying for an annual bout of performing the bard -- the 19th Annual Fall Shakespeare Festival -- and the most famous of the British playwright's works, Romeo & Juliet, will be performed this Thursday and Friday at Mount Greylock Regional High School. Tickets are only $5 for students and $7 for adults and organizers say there will be a cornucopia of refreshments and baked goods during each intermission. There is no Saturday performance. 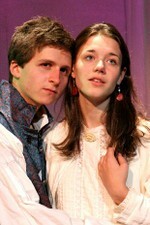 The Greylock show stars seniors Davy Payne as Romeo and Lizzie Fox as Juliet. The Mount Greylock cast will also perform at 6:30 p.m. on Fri., Nov. 16 at the Founders' Theater at Shakespeare & Co. in Lenox. Other high schools in the Berkshires will join Mount Greylock students on Thurs.-Sat., Nov. 15-17, in back-to-back performances of the bard's plays at Shakespeare & Co.'s Lenox campus. Those performances are also public. For a full schedule go to the website, or call the box office at (413) 637-3353. "The Fall Festival has a very specific aesthetic," says Libby Augarten, a Shakespeare & Co. staffer assigned to co-direct the Mount Greylock production. "We wait until auditions are over to choose a play, so we can pick the one that's just right for a particular group of students." The process of picking the right play from Shakespeare's repertoire for each school can be painstaking, says Augarten. "The students and directors generate the work together, and the process is just as important as the finished production. We ask the students to make decisions, have opinions, take risks, be articulate about their feelings, and be themselves." Full disclosure: A son of this post's author has a role in the MGRHS production. North Adams, MA - Beginning November 3, Northern Berkshire Creative Arts offers basic movement and technique from modern dance and yoga to youth. Participating both as a group and as individuals, dancers will harness their physicality in positive ways as they discover the joy of expressing themselves through movement. Scholarships are available. To register, print out a registration from the website, or phone 413-663-8338. North Adams, MA - The North Adams Public Library features North Adams native artist Jennifer K. Mulcahy in a solo art show November 1 - December 31. The show is entitled Inner Visions, and is a collection of surrealistic photomontages, photomanipulations, infrared photography and oil paintings. Art is on display on both floors of the library. There will be a walk and talk with the artist on November 8 from 6:30-7:30 at the library. Art can be viewed from November 1 - December 31 during library hours: Mondays, Tuesdays, Thursdays 9-8; Wednesdays, Fridays 9-5; Saturdays 9-1. All art is for sale through the artist. For more information, call 413-662-3331 or visit http://www.jenniferkmulcahy.com. North Adams, MA - Here is a listing of Winter/Spring shows and artists at the gallery at Papyri Books, 45 Eagle Street, Monday through Friday 12:00 – 6:00 PM, Saturday 10:00 – 6:00 PM, Sunday, 12:00 – 4:00 PM. In September and October, Barbara May, featured in November and December, Emily Daunis and in January and February 2008, Gillian Jones. On permanent display are exhibits by Ian Grey, Margaret Weinland and Jennifer Mulcahy. North Adams, MA - Massachusetts College of Liberal Arts will host a forum on Tuesday, Oct. 30, at 3:30 PM in Murdock Hall room 218, to help connect students with members of Berkshire Chamber of Commerce’s Berkshire Young Professionals and to hear about their experiences of living and working in the Berkshires. The event is free and open to the public. Step It Up 2: Who's A Leader? Please join the community at Caretaker Farm on Saturday November 3 from 9:30am - 11:30am for a morning of food, educational activities, and work on the farm as we prepare for winter on the farm and step up our commitment to be a leader by eating locally and living sustainably. We will enjoy chai made with milk from our Jersey cow, Chloe, and taste cheese from Cricket Creek Farm together with bread from our bakery and local apples. Come learn about solar hot water for your home from Craig and Barbara Robertson of Heliocentrix, green cleaning options from farm member Joanna Greenfield, vegetarian meals from Matt and Mary Kelly of the Berkshire Vegetarian Network, and get inspired about other choices for sustainable living that you can make to reduce your carbon footprint. Marion Grillon, farm member and children's librarian will also have stories and simple craft activities for children.